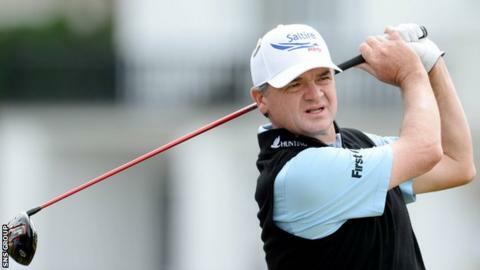 Scotland's challenge at The Open fizzled out on the final day, with Paul Lawrie and Marc Warren ending up in a tie for 40th at St Andrews. Lawrie, the 1999 winner, was in a share of third place at the halfway stage. But the 46-year-old Aberdonian fell down the leaderboard with rounds of 74 and 73 to finish five under par. Glaswegian Warren, 34, played in the penultimate group with Lawrie on Sunday but followed a 72 with 74 to trail winner Zach Johnson by 10 shots. The American prevailed following a four-hole play-off with Louis Oosthuizen of South Africa and Australia's Marc Leishman. Richie Ramsay was the other Scotsman to play on all four days in the weather-delayed major and the 32-year-old from Aberdeen got himself to five under par after nine holes on Monday. But he finished his round on a sour note with four consecutive bogeys for a 74, ending in a tie for 68th on one under. Lawrie was eight under par following opening rounds of 66 and 70 but was unhappy with his putting thereafter. Soon after his final round he wrote on Twitter: "73+1 today hit it lovely putted woeful, massive massive thanks for all the support this week you were amazing out there."